The Flat Racing Master service is a daily email advisory service offering bets on UK horse racing 7 days a week. Promoted by the reputable Betting Gods outlet, this service proposes to send out around 70 to 80 selections per month via email each evening by around 9pm, well in time to get the bets on. We are advised that a betting bank of 100pts is set aside to follow the service whose selections have variable stakes of 1 to 2pts for their win and each-way bets. 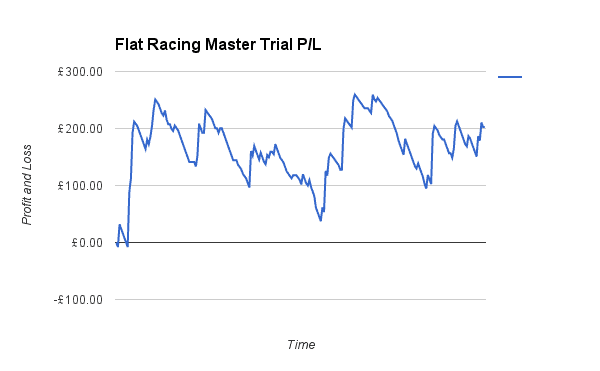 In the 3 months since the 1st December launch, I've been keeping an eye on The Flat Racing Master (FRM for short) and in that time they have advised 219 bets for total stakes of 567pts. So we're looking at around 2.59pts per bet. 66 of the 219 have won/placed for E/W purposes, producing profits of 286.38pts at an ROI of 50.5% from a strike rate of 30.14%. A subscription to FRM is currently priced at £49.95 per month, but there are substantial discounts for those signing up for longer periods, as a quarterly subscription is offered at £119.95, saving you approx. 20% over the quarter. Geegeez readers can take 30 days for just £1 via this link and it's worth noting that as all payments are handled via Clickbank, a full 60-day, no-quibble, money-back guarantee is offered. David Sutton will now follow the fortunes of FRM for the next 60 betting days, using a £4 per point stake to even the bets out to around our nominal £10 stake and we'll report back on a daily basis. 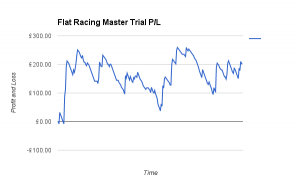 A very nice performance from Flat Racing Master and a trial service which does pass muster. A solid profit of £202.60 at the end of the 60 days equates to a tidy 50 points in the bank. Even accounting for the monthly cost of the service, FRM still emerges in the black. Before we go too overboard with the obvious recommendation, let's take a closer look at the figures. Flat Racing Master came out the stalls very quickly and like every classy 5f speedster, FRM was soon in top gear. Indeed by day 2, the profit had broken through the £200+ barrier. Like most sprinters, the pace dropped a little but with great credit, FRM put in another burst at the 2f marker and repelled most, if not all, challengers. FRM is definitely a top class service but it isn't the form of a pattern winning one just yet. Continuing the sprinter analogy, it's more the Wokingham than the Golden Jubilee. Results suggest it hasn't performed as well as it did in preliminary studies. The ROI and strike rate has dipped but it has carried on upwards and not fallen away. Day 61 was profitable and it should continue that trend. The service is professionally presented, administered and delivered via email the previous evening (there have been a couple of exceptions but the Betting Gods organisation knows how the run a good service. With this smooth running, there's no need to interact with customer services and that aspect of the trial is not rated because of that. Overall, the 'back office' items are of the highest order. The email highlights the selections, meeting, race time and recommended odds (BOG all the way) but there's nothing in the way of analysis or explanation. The tipster gives a comforting impression he/she knows what they are doing and at no stage did it appear to be chasing losses. FRM ticks a lot of boxes, good boxes. Over this review period, FRM certainly was a success and without doubt, it comes recommended and it is s strong recommendation for your portfolio.